Off-road 4 x 4 articulating boom lift, with a working height of 16.80m and a lift capacity of 230 kg. 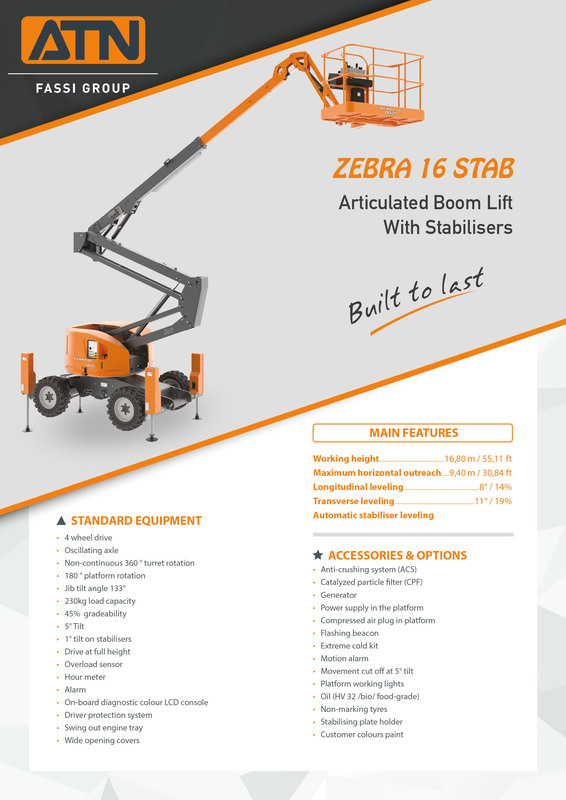 What makes the Zebra 16 STAB truly unique, is that it combines the qualities of an aerial platform with those of a specialised difficult access platform. It can go anywhere on site, including steep slopes, by deploying the stabilisers on demand. This function can be triggered directly from the work post. The ZEBRA 16 STAB lift is perfectly suited to outdoor applications on irregular and steep terrains. The ZEBRA 12 and ZEBRA 16 for working heights of 12 and 16.40m are also available from the same range. The stabilizers allow you to level out your work on a transverse slope of 12 ° / 21% or a longitudinal slope of 9° / 16%. If the stabilisers are not deployed, transport is possible with the platform raised. The 9.40m horizontal outreach at an articulating height of 7.80m allows for a total work surface of 271m² to be covered. 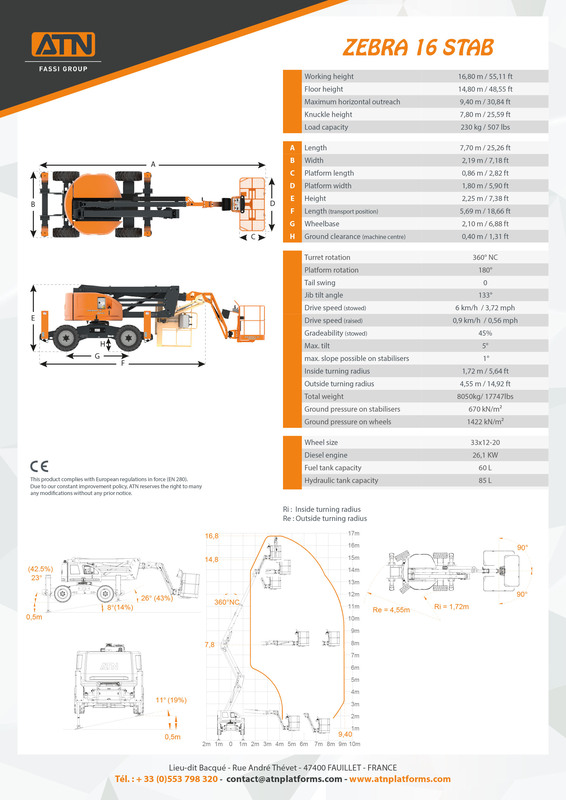 The 360° turntable rotation, 180 ° platform rotation and 133 ° range of pendulum movement allows the articulating boom lift to be positioned with precision. The high ground clearance of 0.37 m can be used on difficult muddy terrains or soft ground. 45% permitted slope with the platform stowed. Equipped with a diagnostic color LCD screen console.